Mitt Romney went on “The Hugh Hewitt Show” yesterday to say that he definitely-certainly-absolutely-not-well-maybe is running for president in 2016. Hewitt: I wouldn’t presume to ask you to say, “Yeah, I’m in the race.” But circumstances change. And if you thought that in fact it were not that way, that you thought you were the only one who could do this, you’d change your mind, wouldn’t you? Hewitt: So you’re telling me I have a chance? Romney: There you go, you remember. You’re telling me I have a chance? That’s one of a million. Hewitt: Hey, all, the takeaway is already circumstances can change. I know how we’re going to play this. But here’s the thing. Many Republicans — including, perhaps, Romney himself — do not believe that any of the candidates the party has on deck have a better chance than he does. In part, that is because of the candidates’ various intrinsic weaknesses. Chris Christie, for instance, seems a bully and a cheat, while Rand Paul sits too far out on the ideological fringe. 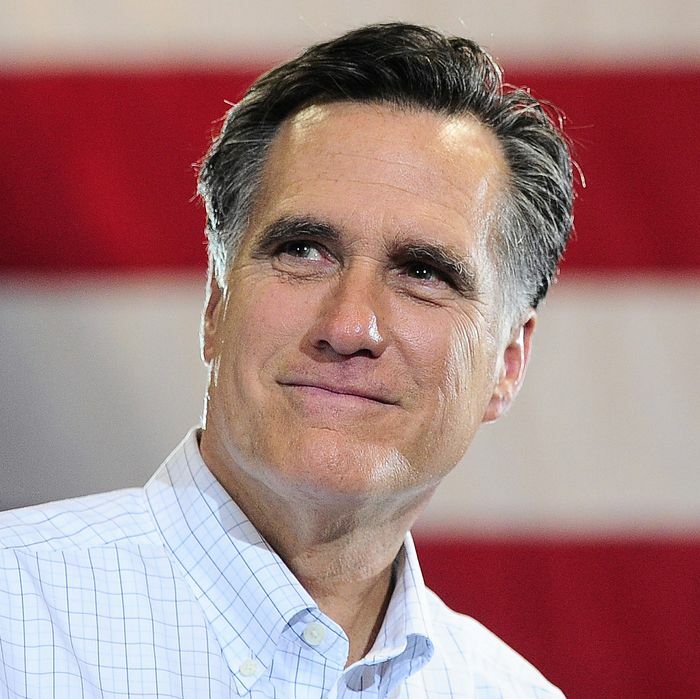 And in part, it is because of Romney’s considerable strengths: his name recognition, his money, his relatively broad appeal, his ties with party donors and kingmakers, and the number of his faithful urging him to go for it. Some early poll numbers are also fueling the Mittmentum. Right now, Hillary Clinton is handily beating many of the front-of-the-pack Republican candidates in the most important swing states, as well as in the general election. Romney would lose to Clinton in the general, the polls show. But he would beat Obama, and he has some decent numbers in decisive states like New Hampshire. Romney himself keeps on throwing kindling on the fire, too, ginning up press and winking every time he promises he would never run again. In the past few days, for instance, he has taken the ALS Ice Bucket Challenge and then sat down for an interview with the Washington Post. And he’s spent the past few weeks crisscrossing the country, fund-raising, endorsing, and making appearances with Republican candidates. Those seem to be the actions of a restless, handsome billionaire in watchful-waiting mode, more so than the actions of a restless, handsome billionaire really and truly retiring from public life. None of this is to say that Romney is likely to kick off a third campaign. But, to paraphrase Lloyd Christmas, what I’m saying is there is a chance.